Flemington trainer Danny O'Brien is already thinking of a spring strategy with Merriest after her comfortable debut win at Caulfield. Merriest almost made the races before Christmas but O'Brien gave the Denman filly more time to develop before the two-year-old showed her talent in the Cove Hotel Handicap (1100m). James Winks sent Merriest to the front early in the $80,000 contest form where the debutante travelled kindly before drawing away from her opposition late to score by 2.25 lengths. O'Brien said the youngster would have one more run as a two-year-old before she returned for a shot at stakes races as a spring three-year-old. "She showed a little bit before Christmas but she probably wasn't ready. She's been ready to come to the races for three or four weeks and we took her to Werribee and she trialled very well,” O'Brien said. "I think she's very smart. 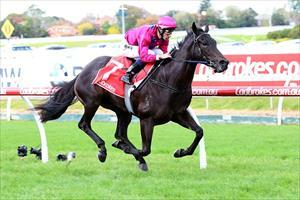 She certainly looks a stakes class mare on what she's done at home. That was a pretty dominant win. Winks said Merriest has had trouble in the gates in her trials but barrier attendant Glen Darrington, who also worked with Black Caviar behind the stalls before her races, helped the filly handle her first race experience with ease. 'She's been a handful at the barrier but he (Darrington) got her there like a little baby today,” Winks said. Phoenix Rising ($8) raced behind the speed before working home for second ahead of the $4.60 favourite Vintage Quartz, which made ground from back in the field.